In my house we actually never get bored with chicken preparations so I try to make something different every time. And after every time when I get good feedback from my friends I really feel great because they actually give me feedback after trying my recipe. Yesterday while chopping the boneless chicken pieces I thought to make some kabab’s for evening snacks but then I thought again I have to cook some dinner so better to make some chicken preparation so my tadays dinner task will be done. 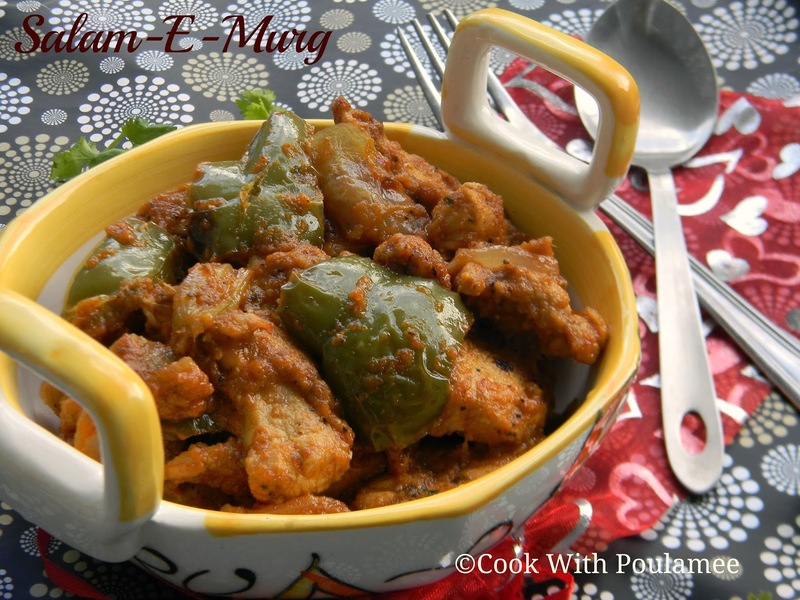 After making it I am really confused what to call the dish then my blogger friend Tanushri suggest a name for the dish which is really uniquea SALAM-E- MURG. 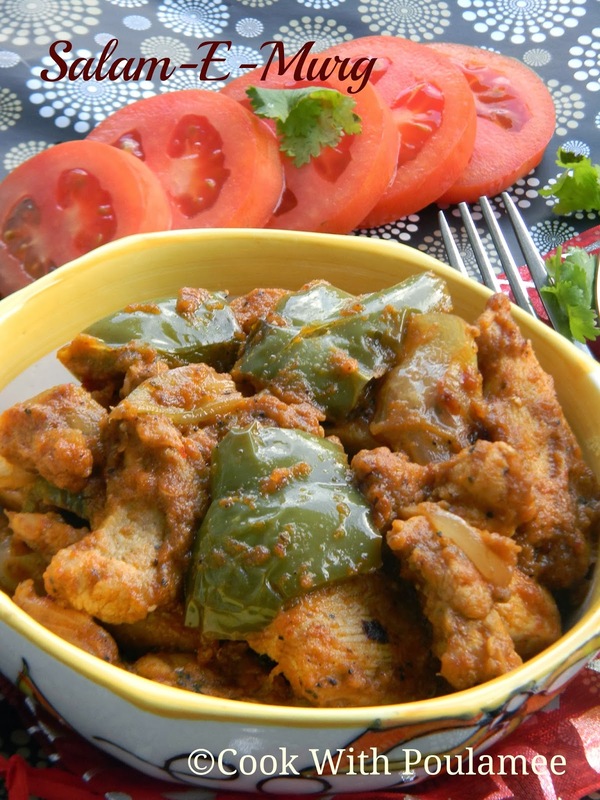 The specialty of the dish is i was marinate the onion and green bell peppers and grill them in oven and add it in the chicken gravy the smoky smell of onions and pepper make the dish super yummy. 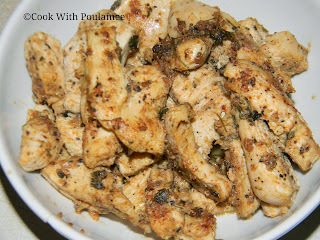 1.Boneless Chicken: 500 gm. (cut them into cube size). 4.Two table spoon ginger garlic and green chili paste. 6.One tea spoon red chili powder, One tea spoon coriander powder, Half tea spoon black pepper powder. 1.One medium red onion cut into big square size. 2.Half green bell pepper cut into big square size. 3.Pinch of salt, black pepper powder, red chili powder. 4. 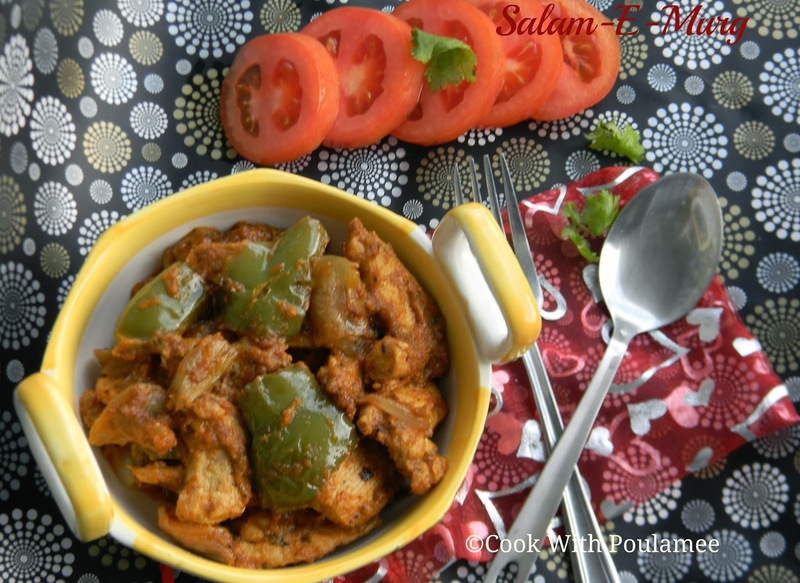 Pinch of Tandoori chicken masala (readymade). First marinate the onions and bell pepper pieces with all the mentioned grilled ingredients for 30 mints. 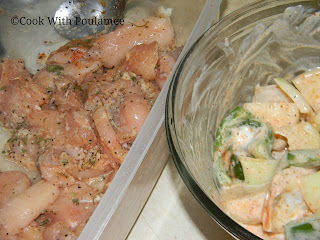 Now wash and clean the chicken pieces and marinate them with curd some salt and black pepper powder for 30 mints. Now make a curry paste with onion paste , ginger garlic green chili paste , tomato paste with all the spices powder. Now grill the marinated onion pieces and bell pepper pieces in high temperature for 10 to 12 mints. Now take out from the oven and keep it aside. Now add some oil in a vessel and fry the marinated chicken pieces in high flame till they turn little brownish and keep it aside. Now add some more oil in the same vessel and add the curry paste and cook till the oil separate from the masala. Now add some salt and sugar and cook for another few seconds. Now add the fried chicken pieces and the grilled onion and bell pepper pieces and mix well with the gravy. Now sprinkle some water and cook for another few mints with a lid. Now remove the lid the super yummy SALAM-E-MURG is ready serve hot with Rice or Roti.